Pen Name Publishing, 9781941541814, 136pp. Coasting follows music industry aspirants, a brooding record store clerk, goth teens, and others into rehearsal rooms, 12-step meetings, a cult indoctrination, even a Russian heavy metal bunker. Along the way, they pursue success, connection, and a sense of purpose. Perched between Middle Men and A Visit From the Goon Squad, Coasting is Ari Rosenschein's debut collection. "His characters inhabit a backstage space, a few steps from glory, looking for the next gig, hoping for a big break, reveling in every note along the way. Their sweet gritty persistence is irresistible." 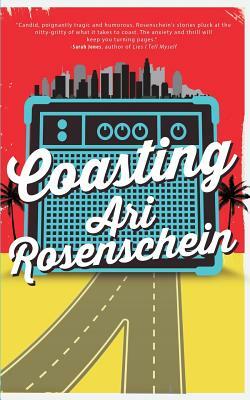 "Ari Rosenschein's Coasting does for Gen Y punks and rockers seeking artistic fame and glory in Los Angeles roughly what Candide did for--and to--its na vely optimistic protagonist. A superb debut collection." "Coasting will make recovering scenesters laugh, nod, and cringe in recognition, and then give thanks they grew up."